This is something which was pointed out to me well after the event and is worth a post-mortem. This is the 4.45 at Newbury yesterday. It was what could be described as a dreadful little maiden with little fear of contradiction. Ten horses were declared and only a handful had ever been on a racecourse before and only two, Magellan and Tango Fire, had ever raced on the flat previously: the same race type as this race. Normally in years gone by I would look at the race to see if anything with a decent Koulds Score was running. Koulds Scores, for those who are unaware, is a scoring system which looks at the prodigeny of the horses’ sires and dams and to compare how each group of offspring compare over going, distance, race-type, race class, race type and age. A score is given to each horse in the race according to the rules of the scoring system (which are explained here) and I have found that in the past that going on the Sire/Dam data is about the only worthwhile angle to look at these races. 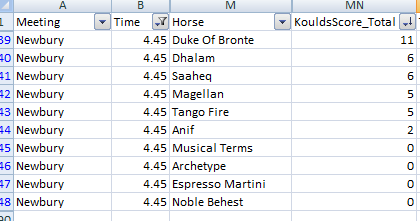 In this race the horse with the best Koulds Score is Duke Of Bronte (the horses are sorted in Koulds Dam order) and with a score of 11 is worth looking at. In such races I would normally have looked at horses with a score of ten or higher but, for one reason or another, the start of the flat season and the maidens have caught me out this year. Anyway, with the Koulds Score being clear by a good five points from the next horses I would have been interested in Duke of Bronte. I have no idea of what the price was like on the exchanges but Duke Of Bronte won by two lengths, running well in the last hundred yards, to win at 100/1. When one has a race with little or no form then cast an eye over the Koulds Scores, sometimes one can find something pop out. Update: The Befair SP for Duke of Bronte was 880.